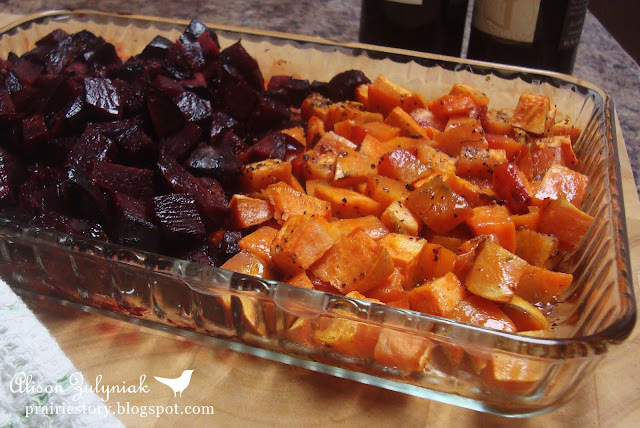 Beets and sweet potatoes go together perfectly - they really enhance the flavor of each other! It's best to cook them separated as in photo so the potatoes don't turn color from the beet juices; but when you eat, you'll want to eat together. - Bake @ 350° for 45-60 minutes. I just love roasted beets!!! I'm trying to teach my girls to love them! Whoa, this looks like something I would really like. Just goes to show you how good the simplest things can be. Hey, that sounds easy and good- never thought to do them together!